This is a 4x4" card I'm entering into the Simon Says Stamp Monday Challenge. To create this card I cut an 8-1/2x11" piece of cardstock down to 8" wide and then 4" wide. I color blended some distress ink in greens and yellows. 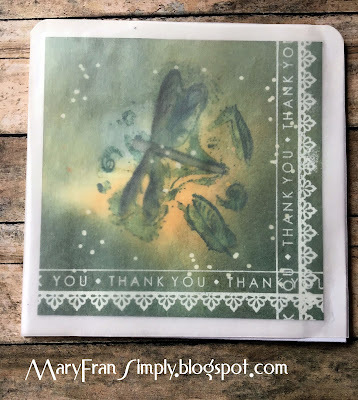 Next I stamped a verrrrry old dragonfly stamp in the green and used a white Signo pen to add white dots around the stamping. I stamped the thank you stamp in versamark and embossed with white detailed embossing powder. When it was finished, it looked a little harsh, so I cut a vellum panel to lay over it, and that completes it. Thank you for reading this and the materials used are listed below.